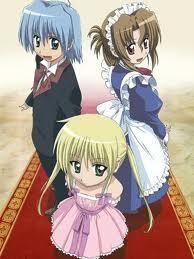 Yep, more Hayate. The latest issue of Weekly Shonen Sunday confirmed that another anime of Hayate no Gotoku! is on track for the Spring 2013 anime season. An unexpected piece of news for sure, seeing as how the latest installment just finished airing. Hayate no Gotoku! has been one of Weekly Shonen Sunday’s go to for an anime adaptation. One 52 episode season, a 25 episode sequel, a movie and most recently a 12 episode side story. It hasn’t been confirmed if this is a sequel or yet another one like Can’t Take My Eyes Off You. Since I’ve only seen the latest anime, I’m not excited for this announcement. I’ve been reassured by many that the latest anime is terrible when compared to the first two seasons. In any case I’m sure fans want a sequel more than another spin-off/side story. Since the announcement was made in a double issue of Weekly Shonen Sunday, I’m hoping that we’ll be hearing about another adaptation in the next few days. It happened last time with the announcement of The World God Only Knows III and Arata Kangatari. I guess the Hayate franchise isn’t ready to stop producing anime.